The Convention on the Rights of Persons with Disabilities (CRPD) is an international human rights treaty that seeks to prohibit discrimination against people with disabilities around the world. The CRPD was inspired by U.S. leadership in recognizing the rights of people with disabilities, particularly with the adoption in 1990 of the Americans with Disabilities Act (ADA). This social media guide on CRPD is meant to help you and your organization educate, equip, encourage, and empower local partner organizations and coalitions, activists, and communities to take action. And it’s a way for you to take part in global conversations related to the work we are doing to ratify CRPD. Engage your network of friends, family and community! Use the platform to educate, encourage and mobilize your network into action. Check out the sample Facebook posts, short links and sharable images below. Sign the petition: The Senate needs to fight for the 57.8 million Americans with disabilities, 5.5 million American veterans with disabilities, and the 1 billion people with disabilities around the world and vote to ratify the Convention on the Rights of Persons with Disabilities (PDF). Take action by signing this petition to let your Senators know that you support the treaty! Contact your Senator: The Disability Treaty, or the Convention on the Rights of Persons with Disabilities (CRPD) is an international treaty that was inspired by U.S. leadership in recognizing the rights of people with disabilities. US ratification would signal a commitment to bettering the lives of 1 billion people with disabilities worldwide! 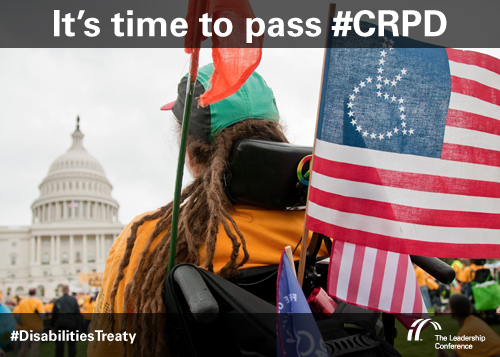 Take action now, tell your senators via phone, email, or tweet that #ISupportCRPD! Visit the Action Center to learn more. Use Shareable Images: A great way to quickly get attention is to post images with great information on CRPD. Use the samples in this post! Twitter is a great way to connect with people who share your interests or who might be interested in what you have to say. Use hashtags (e.g., #ISupportCRPD) as a way to group tweets together to make them visible to a wider audience. Keep your tweets short and sweet and get creative! Check out our samples below. Senate Targets: A direct tweet for people from Tennessee could look like this: @SenBobCorker vote to ratify #CRPD so the US remains a leader in protecting civil & human rights of people w/ disabilities. 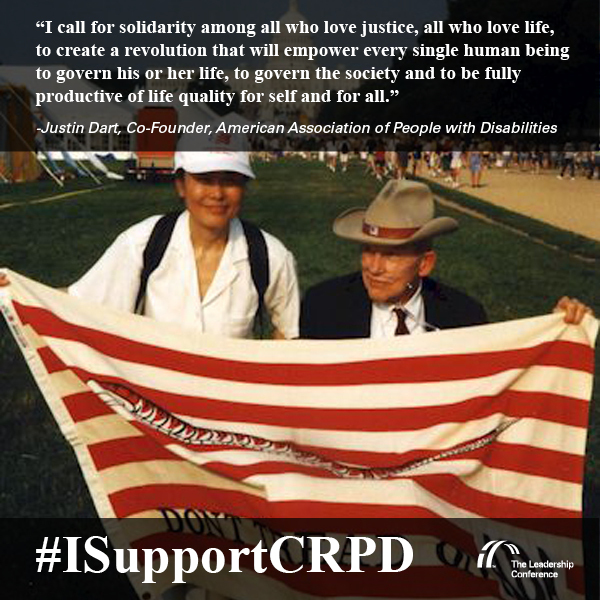 #ISupportCRPD! Tweet your Senators to tell them that you support the #DisabilitiesTreaty! Use the hashtag #ISupportCRPD! #ISupportCRPD bc protecting the rights of people with #disabilities is a basic function we all agree on.